A well-designed material handling system and storage layout is critical to warehouse productivity and space efficiency. Whether you’re building a new warehouse, expanding your facility or looking to improve your current space, E-Distribution has the expertise and resources you need. We use the latest assessment and CAD 3-D simulation tools to analyze your current operation and develop a custom layout to meet your goals. 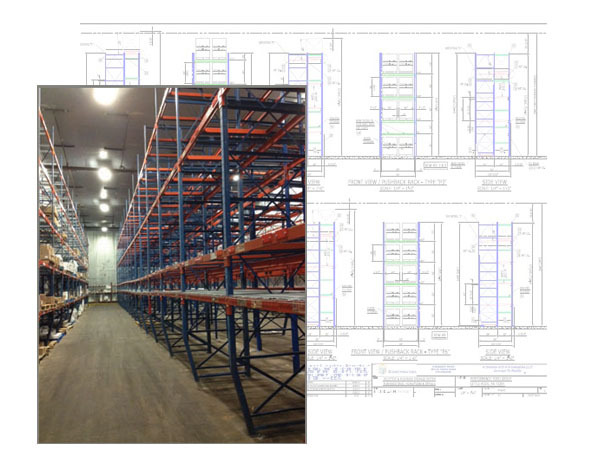 Phase 1: Facility and Data Analysis – We analyze inventory data, SKU movement and cube details to measure the effectiveness of existing storage mediums and determine storage types and quantities needed to improve efficiency. Phase 2: Concept Plan Development – Our design engineers develop several concept plans for various material handling system layouts and equipment options (including racking systems and distribution system designs), each with budget pricing to verify and return on investment. Call us for a budgetary quote for need support services. Project management and site management can be quoted using and hourly fee-based structure.